Bert Jordan was born on September 3, 1919, in Covington, Oklahoma. He enlisted in the U.S. Army Air Corps on November 17, 1939, and after completing basic training he completed aircraft and engine mechanic school in December 1941. His first assignment was as a B-25 Mitchell mechanic and flight engineer with the 95th Bomb Squadron of the 17th Bomb Group at Pendleton Army Airfield, Oregon, from January 1942 until he was selected for the Doolittle Mission in February 1942. Sgt Jordan was the engineer-gunner on the fourth B-25 to take off from the aircraft carrier USS Hornet (CV-8) on April 18, 1942, and after bombing Tokyo his crew flew to China and bailed out when their aircraft ran out of fuel. He remained in the China-Burma-India Theater after the raid, and served as a B-25 flight engineer and gunner with the 11th Bomb Squadron of the 341st Bomb Group in India from March 1942 to October 1943. TSgt Jordan served with the 502nd Bomb Squadron in the United States from October 1943 to June 1944, and then served as a B-29 Superfortress aircraft maintenance technician with the 457th Bomb Squadron of the 330th Bomb Group in Texas and Kansas, followed by service with the squadron on Guam from February 1945 until he left active duty on October 30, 1945. SSgt Jordan returned to active duty in the U.S. Air Force on December 29, 1947, and then served as an aircraft maintenance technician with the 4136th Air Force Base Unit at Tinker AFB, Oklahoma, from December 1947 to August 1948. 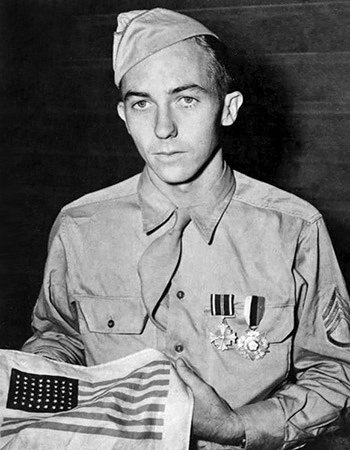 His next assignment was as an aircraft maintenance technician with the 1421st Maintenance Squadron (Provisional) in Germany during the Berlin Airlift from August to November 1948, followed by service as an aircraft maintenance technician with the 303rd Air Repair Squadron in Germany from November 1948 to January 1949. He served as an aircraft maintenance technician with the 2920th Aircraft Maintenance Squadron at Tinker AFB from January to July 1949, and then with the 3023rd Base Services Squadron of the 2754th Experimental Wing at Holloman AFB, New Mexico, from July 1949 to December 1950. MSgt Jordan next served as an Aircraft Maintenance Inspector with the 17th Field Maintenance Squadron in Japan and then at Hurlburt Field, Florida, until March 1957, and then with the 17th Tow Target Squadron after it was redesignated and moved to Vincent AFB, Arizona, from March 1957 to September 1958. His next assignment was as an RB-66 Destroyer Senior Aircraft Flight Chief with the 1st Tactical Reconnaissance Squadron of the 10th Tactical Reconnaissance Wing at Spangdahlem AB, West Germany, and then at RAF Alconbury, England, from October 1958 to June 1961, followed by service as a Section NCOIC with the 95th Organizational Maintenance Squadron at Biggs AFB, Texas, from June 1961 to December 1964. SMSgt Jordan served as a Section NCOIC with the 96th Organizational Maintenance Squadron at Dyess AFB, Texas, from December 1964 to January 1967, and then as at Aircraft Maintenance Superintendent with the 100th Airborne Missile Maintenance Squadron and then the 100th Organizational Maintenance Squadron at Davis-Monthan AFB, Arizona, from January 1967 to April 1968. His next assignment was as Aircraft Maintenance Superintendent with the 4472nd Combat Crew Training Squadron at Davis-Monthan AFB from April to October 1968, followed by service as Maintenance Superintendent with the 14th Tactical Reconnaissance Squadron at Udorn Royal Thai AFB, Thailand, from October 1968 to July 1969. Chief Jordan's final assignment was as NCOIC of the Periodic Maintenance Section of the 4780th Organizational Maintenance Squadron at Perrin AFB, Texas, from July 1969 until his retirement from the Air Force on August 1, 1971. Bert Jordan died on April 3, 2001, and was buried at the Georgetown Cemetery in Pottsboro, Texas. For extraordinary achievement while participating in a highly destructive raid on the Japanese mainland on April 18, 1942. Sergeant Jordan volunteered for this mission knowing full well that the chances of survival were extremely remote, and executed his part in it with great skill and daring. This achievement reflects high credit on Sergeant Jordan and the military service. 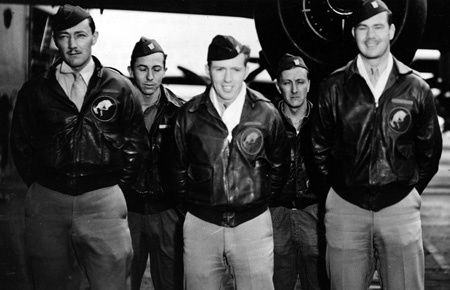 Crew 4 of the Doolittle Raiders, left to right-Lt Harry C. McCool, Cpl Bert M. Jordan, Lt. Everett W. Holstrom, Sgt Robert J. Stephens, and Lt Lucian N. Youngblood.